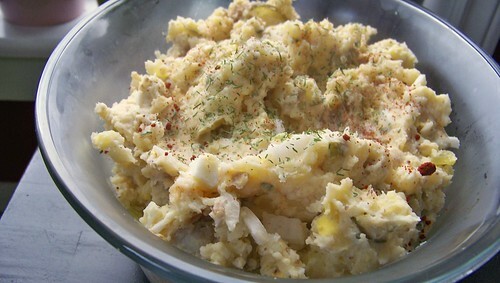 We had a Valentine’s cold-plate potluck at work on Tuesday and I was assigned to make a potato-egg salad. 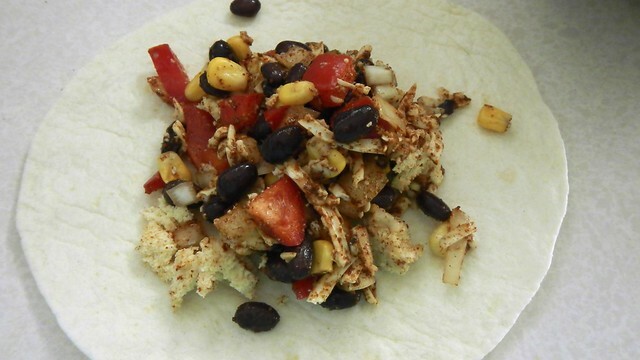 And as the best one out there belongs to the Pioneer Woman, that’s the one I made, with some modifications of course. Ever since the grocery store down the block closed I have found myself without certain key ingredients at unfortunate times. Today, it was green onions. So I improvised. 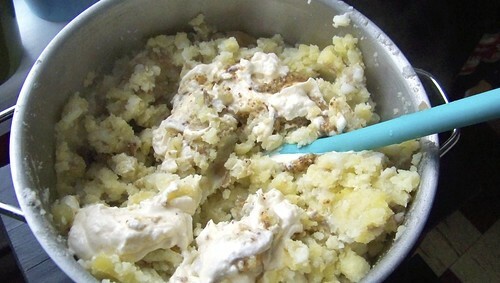 Wash and cube about 5lbs potatoes. I used two different kinds, for the colour. 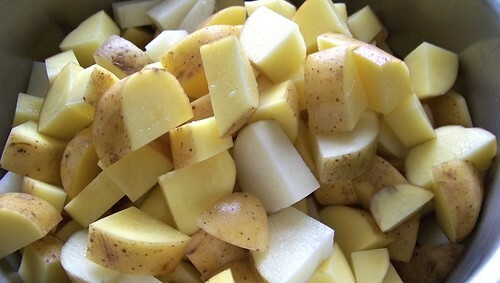 You can peel them if you want, but I like the texture and flavour of potato skins so I left them in. 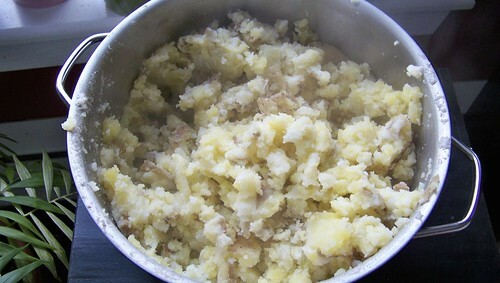 Plop those in a large pot and boil them until they’re tender and mashable. 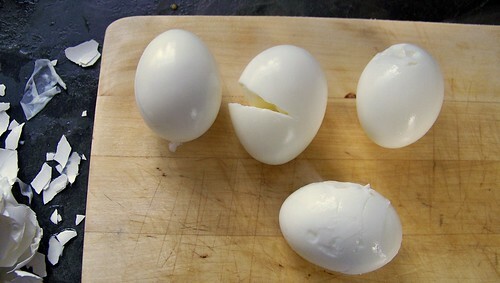 You’re also going to want to hard boil 4 eggs, through whatever method you use. 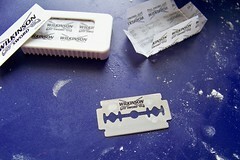 When they’re ready, peel them up. Mine were pretty recalcitrant and refused to be peeled in a civilized manner. The shells would not come off without a fight. 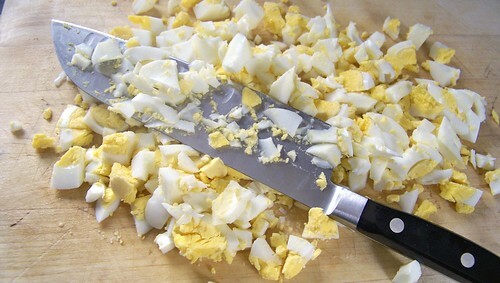 I punished them through the vigor of my chopping (even if your eggs are well-behaved, you’ll still want to chop them up). 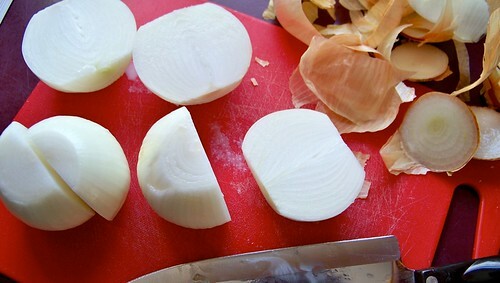 Finely chop as well half an onion (or 5 green onions). 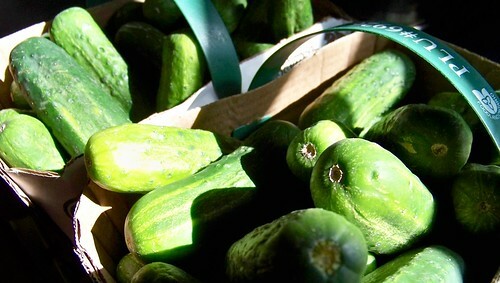 And a handful of sweet pickles. 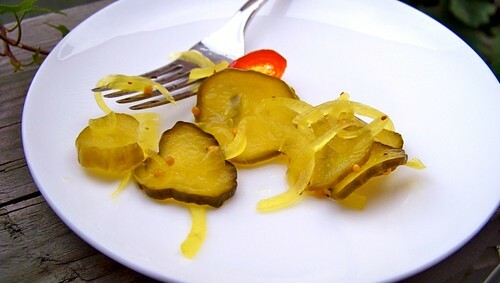 You can use dills, if you prefer, but I think it’s better with the sweet ones. 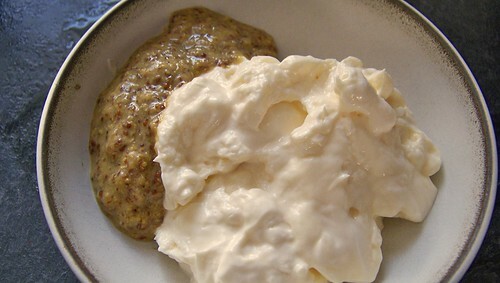 In a bowl, mix together about 1 1/2 cups mayonnaise and 4 tablespoons mustard (I used a stone-ground dijon here, but you can use what you like). 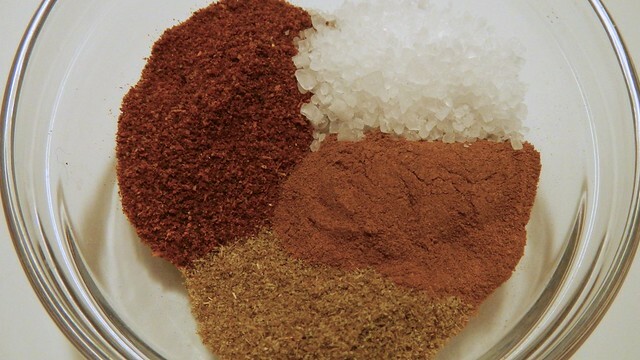 In a wee bowl, arrange about 1/2 teaspoon paprika and 1/2 teaspoon kosher salt. 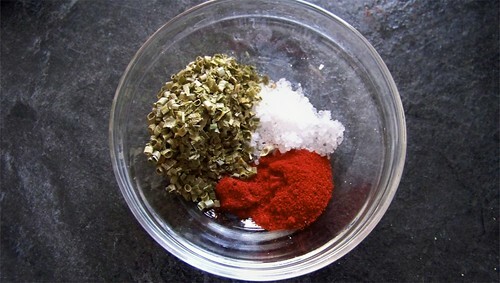 I also added 2 tablespoons dried chives, for colour, as I was missing the green onions. 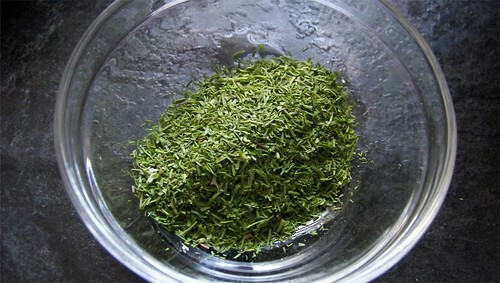 I also had another wee dish of dried dill, for garnish. 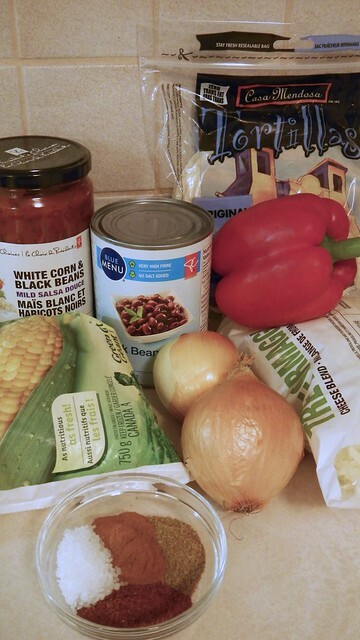 So here is my mis en place. 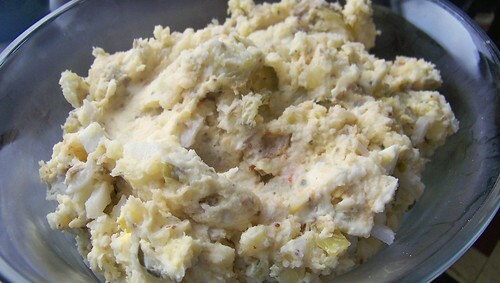 Mash your boiled potatoes. I really like the colour combination of the white and yellow ones here. 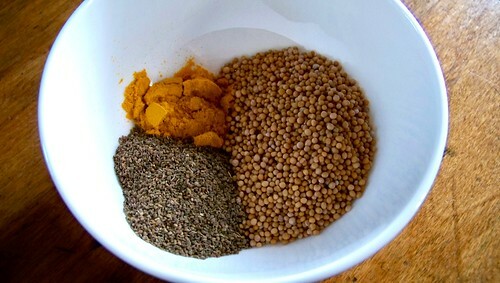 Stir in your mayo/mustard mix. 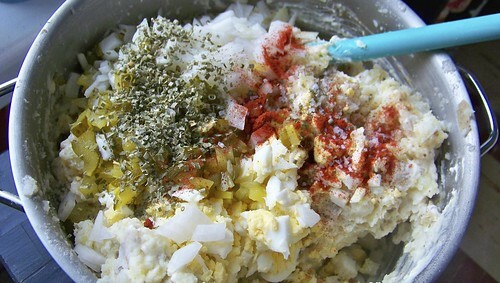 Add in your eggs, onions, pickles, paprika, salt, and optional chives. 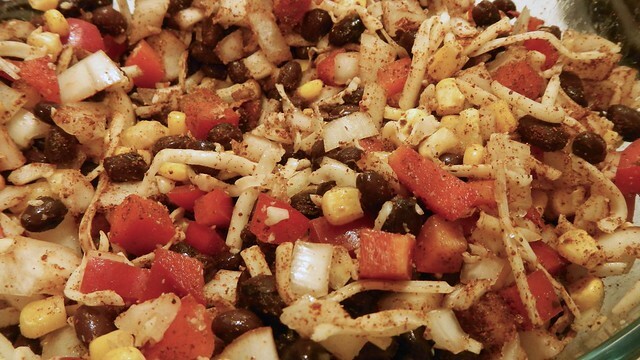 Make sure to scrape the bottom so you get everything mixed in evenly. 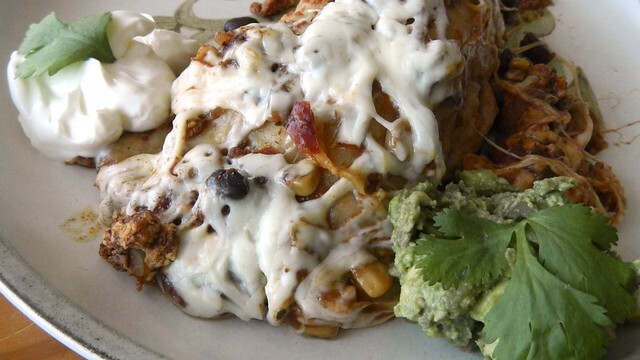 Plop it in a serving dish. 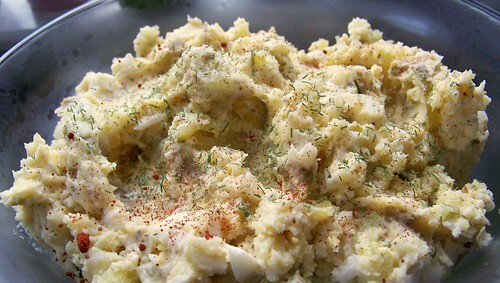 The best part about this potato salad is it’s good hot, warm, and cold. Garnish with a sprinkle of paprika and some dill, or whatever floats your boat. It’s not elegant, but it’s good! 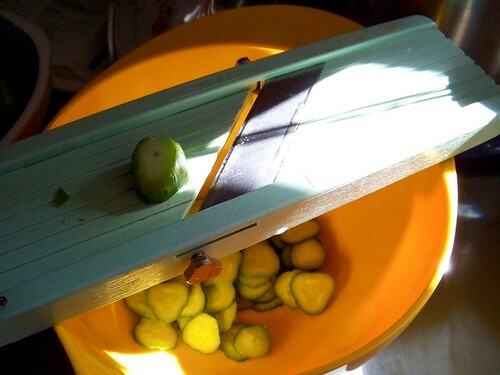 One summer when I was young, our kitchen was filled with cucumbers. 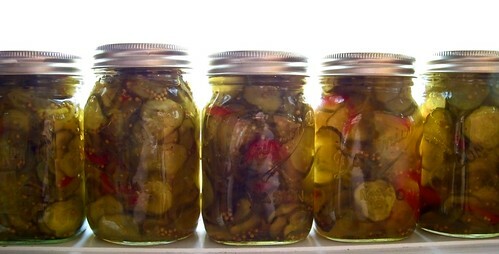 We made them into dill pickles and bread and butter pickles and there wasn’t a single counter that wasn’t packed with shiny, hot jars of the stuff. The whole house smelled of vinegar. It was great. 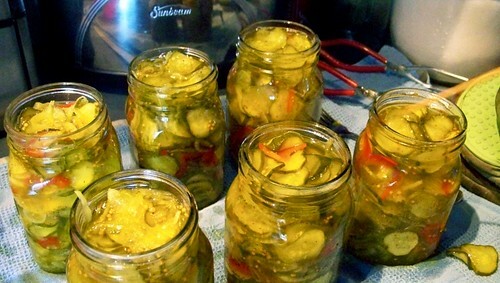 We made two batches of bread and butter pickles on this particular day and it took a long time, what with the sterilization and the soaking and the canning, so make sure you have a free day and plenty of space when you’re going to do this. 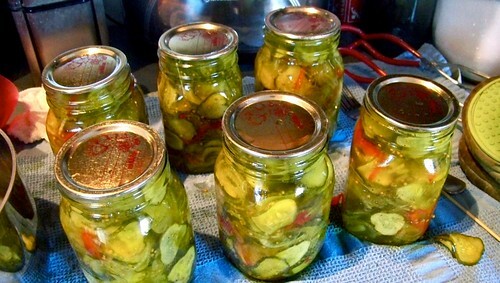 One batch of bread and butter pickles yields about six 1-pint jars and uses 3L (about 4lb) of pickling cucumbers. 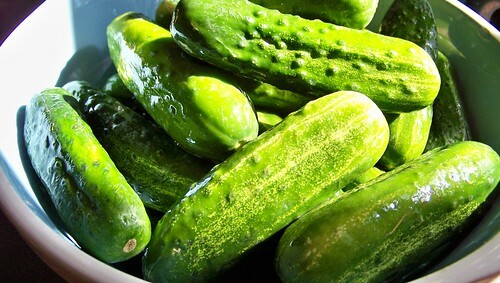 Wash your cucumbers. Scrub them and all their knobby bits well. 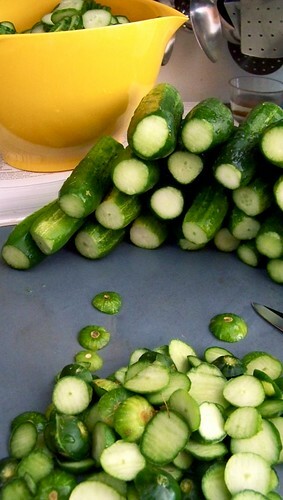 Cut the tops and bottoms of the cucumbers off (the bloom and stem ends). 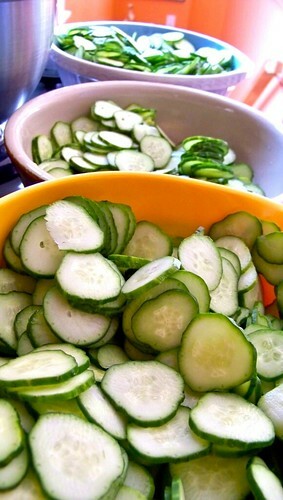 Using a mandolin or a food processor, slice the cucumbers into 1/4″ thick rounds. Please do not cut off any of your fingers. Mandolins are vicious. 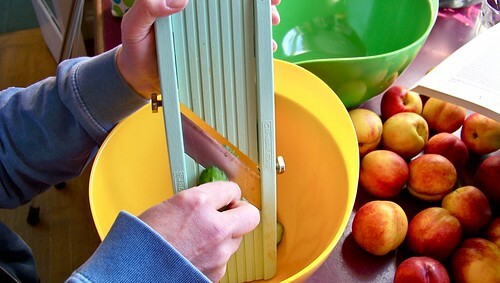 This will take a while, especially if you are doing two batches. 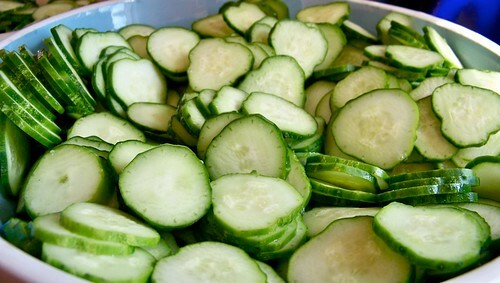 Now you have a helluva lotta cucumber slices. Put some on your eyes and take a rest for a while. Just kidding. There’s work to be done. Now you have to slice some onions. 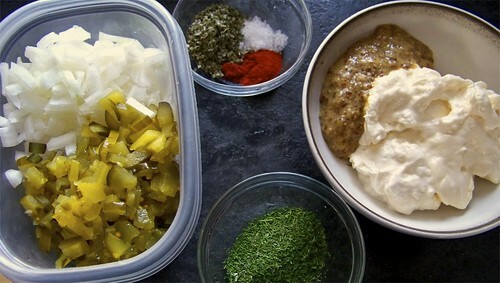 Use about three medium onions per batch of pickles. 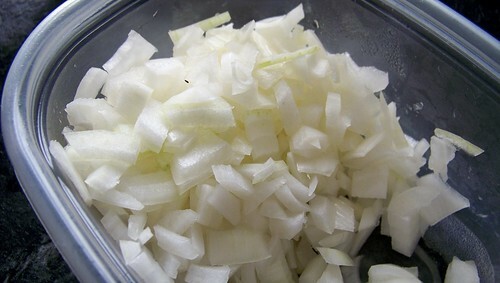 Peel the onion and slice it in half lengthwise, then use a mandolin or food processor to slice them the same thickness as your cucumbers. 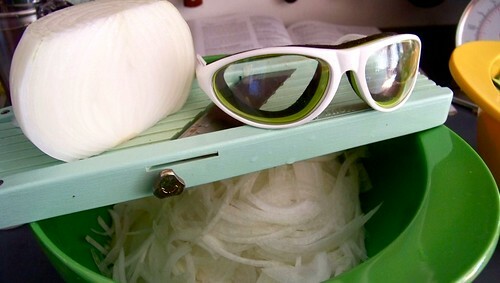 I like to use the Onion Goggles here to avoid bloodshed. Or tearshed. Or both. If I’m weeping uncontrollably I may slice off an appendage on the mandolin. 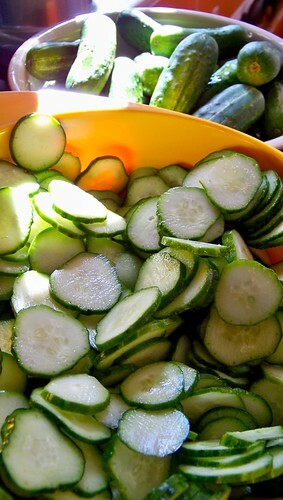 Put all your cucumber and onion slices in an enormous bowl and sprinkle them with kosher or coarse pickling salt. 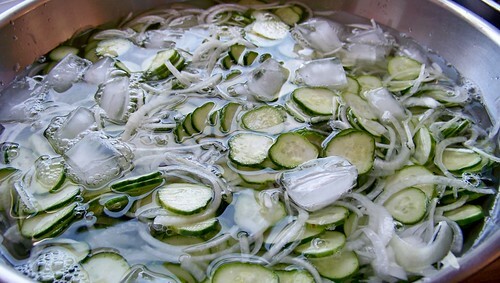 Cover with ice water (or water with ice cubes in it) and leave to soak for three hours. Now you can take a break. Or make something else while you wait. 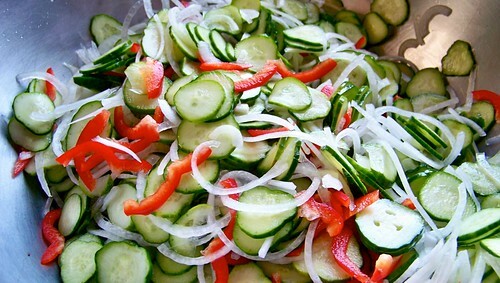 You know what, why don’t you cut up two sweet red peppers, sliced thin on the mandolin again, and add them to the pile? They make for a nice colour contrast in the jar. Drain the vegetables after their three-hour soak, rinse them thoroughly in cold water, and then drain them again really well. At this point you should probably start preparing your jars and lids. 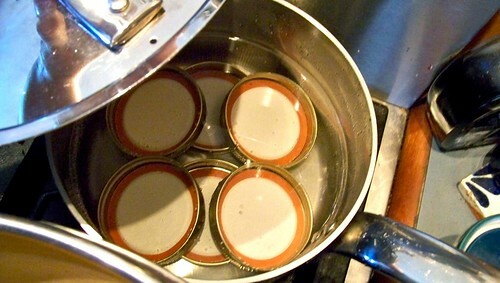 Put your lids and rings in a pot of water and set that to boil. 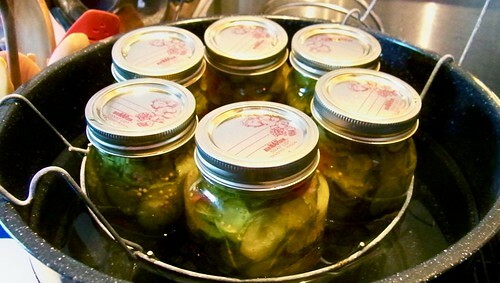 Plop your jars in your canner and set that to boil as well. This will take a while. 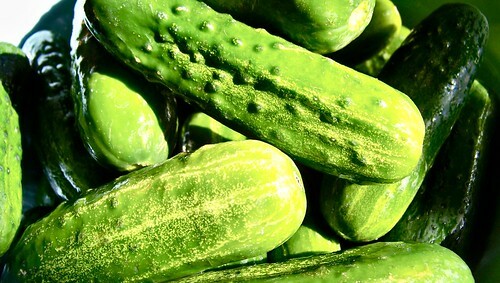 Now you can prepare your pickling brine. 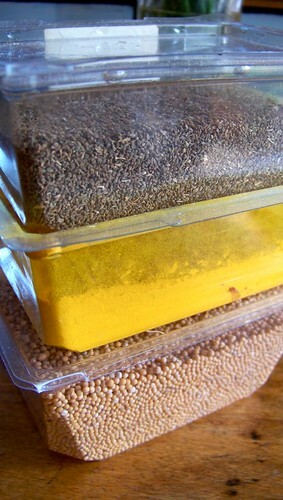 The key spices here are celery seed, turmeric, and yellow mustard seeds. 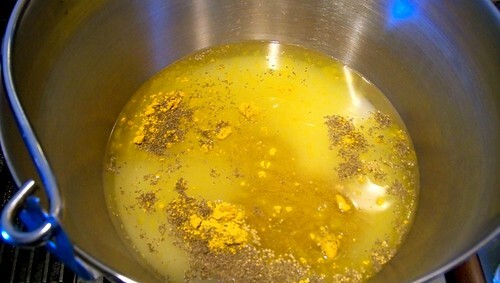 In a small bowl, put 2 tablespoons mustard seed, 2 1/2 teaspoons celery seed, and 1 1/2 teaspoons turmeric (the turmeric is what turns everything yellow). Set it aside for now. In an enormous pot (we used the large maslin pan from Lee Valley), put 5 cups granulated sugar (I know, it seems like an awful lot). 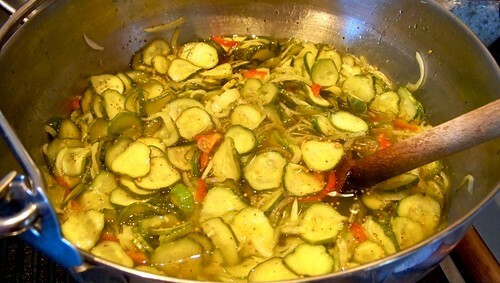 Add to this 4 cups pickling vinegar. 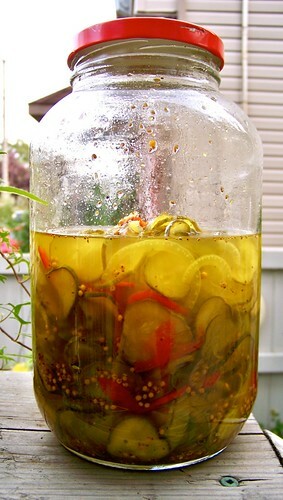 My grandmother insists that all pickling (unless otherwise stated) must use pickling vinegar. It’s about twice as strong as regular distilled white vinegar. 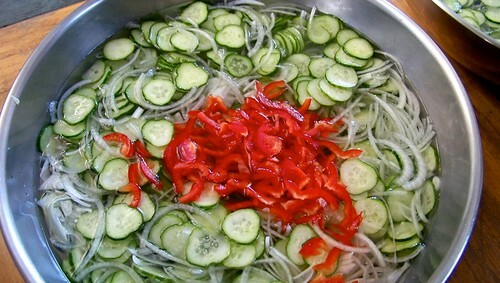 Add in your pickling spices and give it a stir. 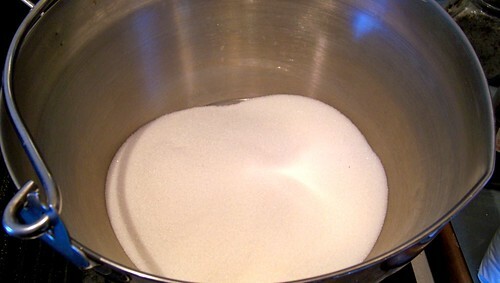 Bring it to a boil and dissolve the sugar. 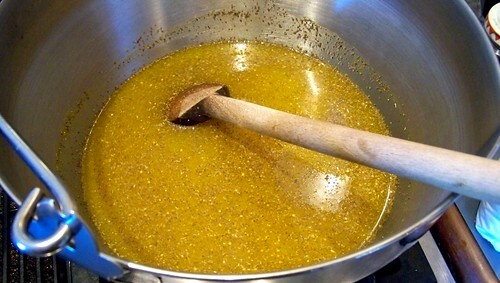 Now plop in your vegetables and cook, stirring frequently, until they are tender and yellow and the liquid is once more boiling, about fifteen minutes. 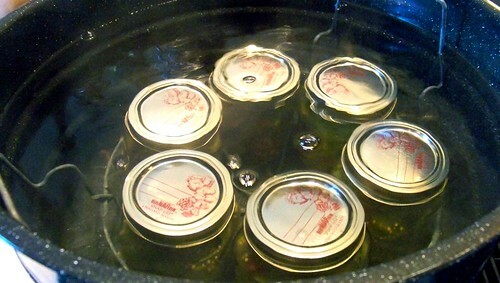 Once your jars have been boiling for ten minutes, you can haul them out of the canner. Turn off the heat for now to allow the water to cool slightly. 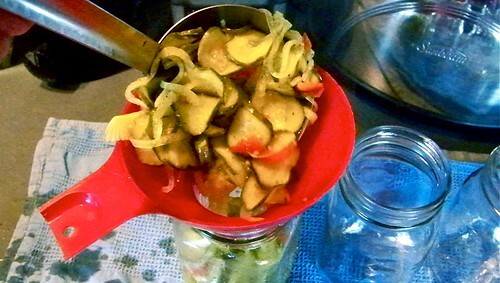 Drain the jars carefully using a jar gripper and put them near your pickle pot. 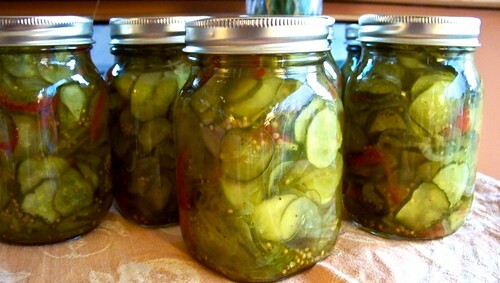 Using a canning funnel, carefully ladle pickle mixture into your six jars to within a half or quarter inch of the top of the jar. It’s pretty much a guarantee that you, your counter tops, and everything around you will become extremely sticky at this point. 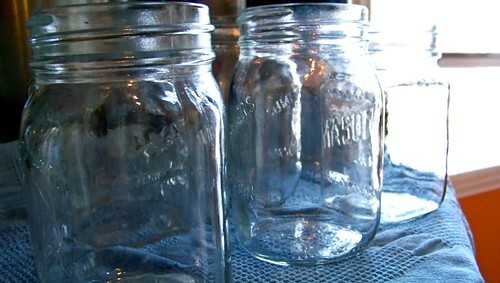 Make sure there is plenty of liquid in the jar as well, but be careful to leave some space at the top. 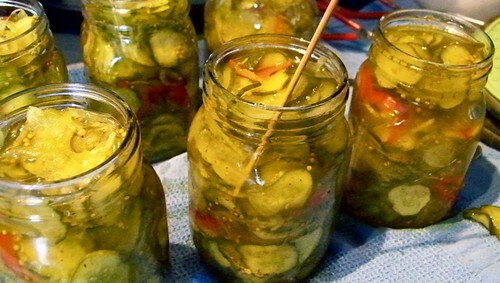 Use a wooden skewer (don’t use metal) to poke around and remove the air bubbles from amongst the pickles. 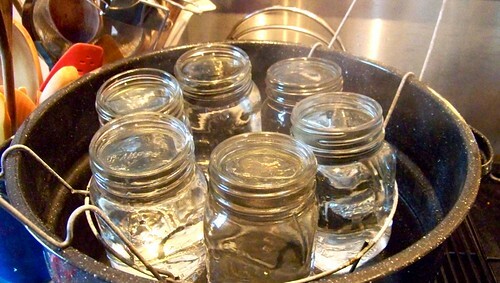 Remove your lids and rings from the heat and carefully place the lids on the jars. 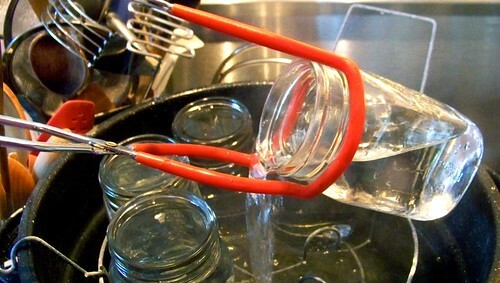 Twist the rings on to fingertip tightness and return the jars to your canner. Dunk them under and bring the water to a boil for fifteen minutes. 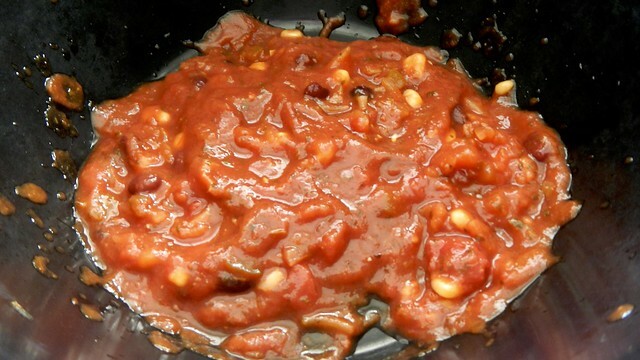 Remove the jars from the canner and allow to cool. As they cool they will seal with a lovely POP sound. 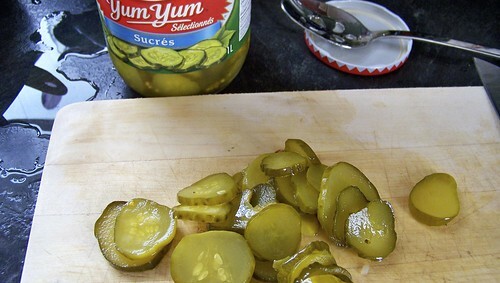 You can eat these pickles right away, but store opened jars in the refrigerator. 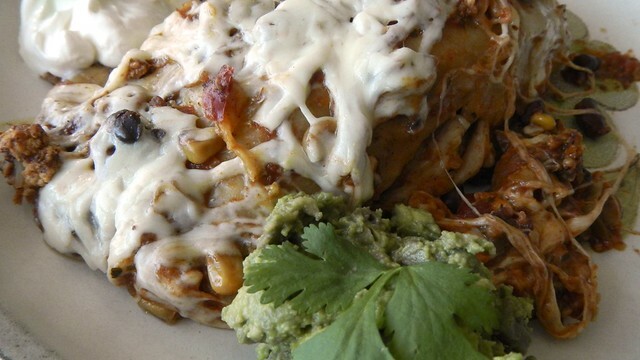 Serve as a side to your dishes, put in sandwiches, or just eat straight from the jar. Your choice. 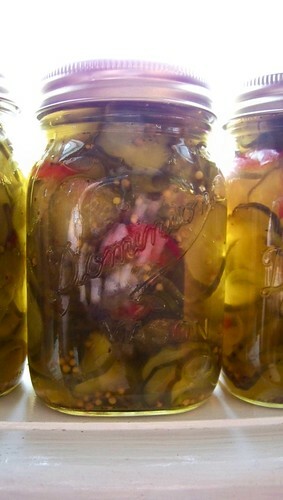 Our two batches left us with some extra pickles, which we put in a jar in the fridge. 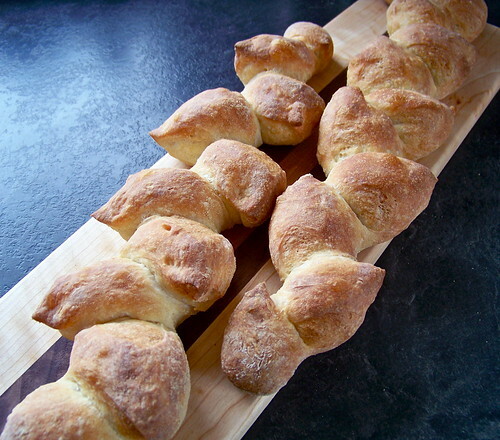 After some successes with Peter Reinhart’s Lean Bread, the Pie and I decided to branch out a bit and try the French bread in time for a Victoria Day dinner with KK, Il Principe, and the Norwegians. 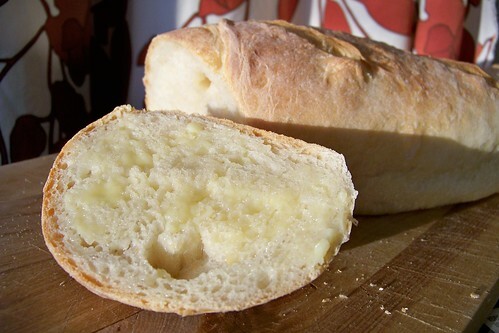 This recipe uses the same ingredients as Lean Bread but a slightly different technique, so I really hoped I could get this right on the first try. 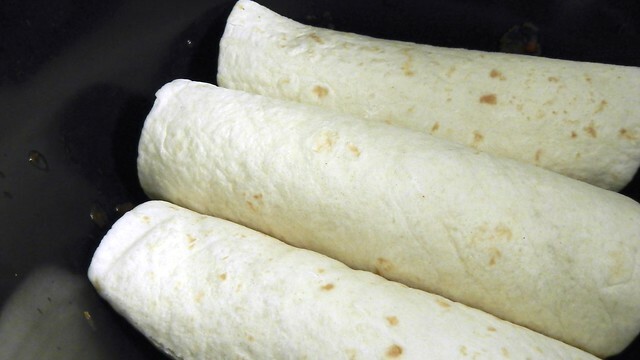 I recommend you start with Lean Bread to get used to the whole process before you venture into French Bread, which requires a bit more concentration. 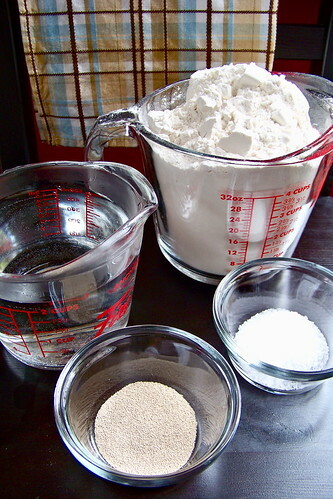 Check out the photos from the Lean Bread experiment to familiarize yourself with the basic steps and baking preparations. 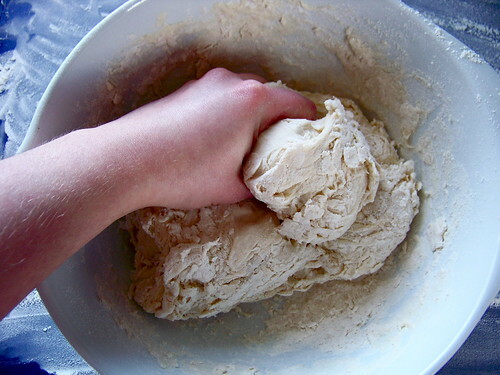 Because this recipe involves hand kneading I decided to do my initial mixing by hand as well, as I’m not entirely sure how to use the dough hook on my stand mixer. 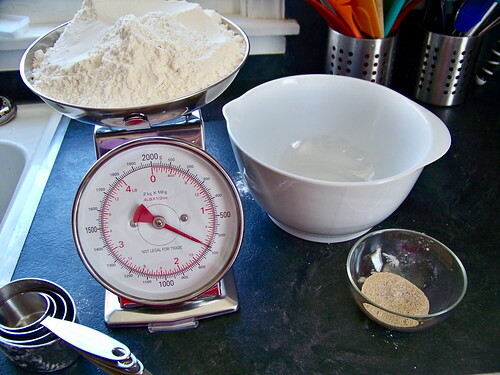 I also decided to measure my flour by weight and not volume and it worked out really well. 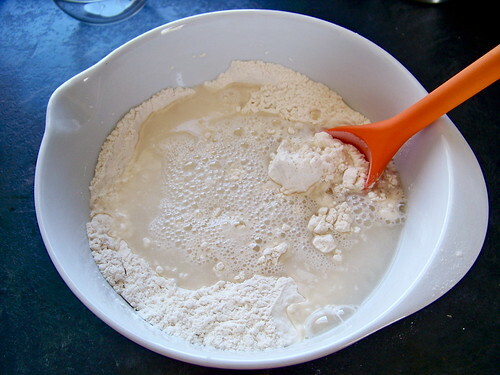 Put, in a bowl, 5 1/3 cups bread flour (24oz/680g), 2 teaspoons salt (or 1 teaspoon kosher salt), 2 1/4 teaspoons instant yeast, and 2 cups lukewarm water. Mix ’em up, for about a minute. If your spoon gets too doughy, dip it in warm water. 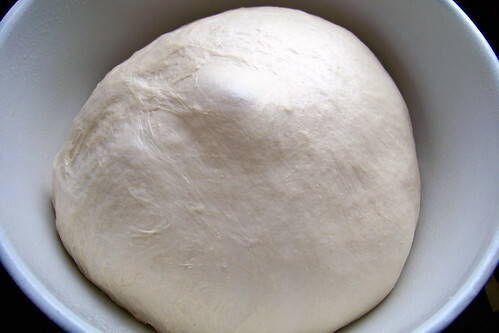 Let your dough rest for 5 minutes. It should be a coarse, shaggy ball at this point. 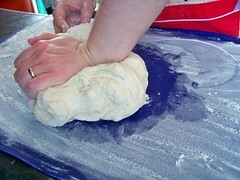 Now, knead the dough in the bowl by hand for about 2 minutes, getting in all that excess flour. 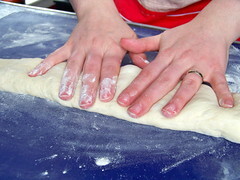 If it becomes too tacky, add more flour. If it becomes too dry, add some warm water. 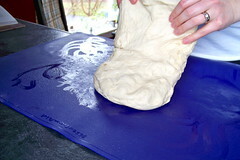 Now move onto a lightly floured surface. 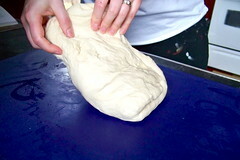 Knead the dough for another minute, pushing and folding it together. 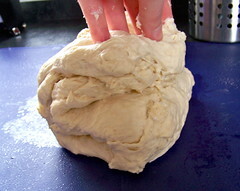 If you find that the dough is still pretty tacky at this stage, don’t add more flour. 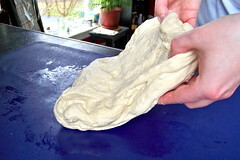 Instead, stretch it and fold it once or twice, just like we did with the Lean Bread, until the surface texture evens out. 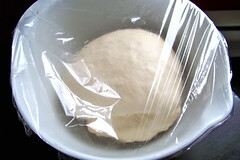 Transfer the dough to a bowl, cover it with plastic wrap, and refrigerate it overnight. 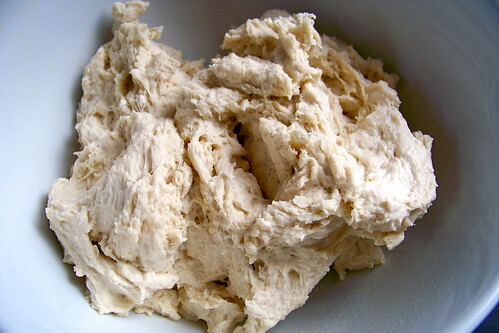 If you are going to make the bread over the course of several days, now is the time to separate it into separate chunks for individual fermentation. 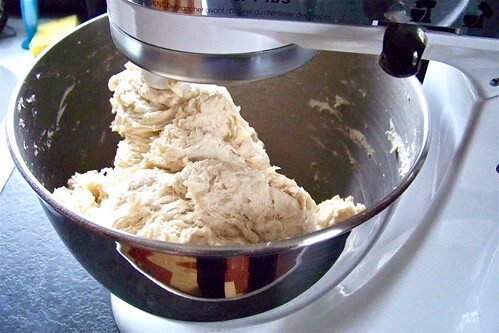 Take the dough out of the refrigerator at least two hours before you plan to do your baking. I woke up early just to take it out of the fridge. Then I went back to bed. 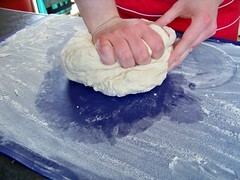 Be gentle in transferring the dough to your floured work surface. You don’t want to disturb the bubbles. 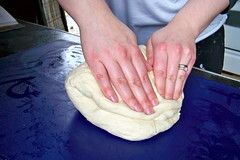 Divide the dough into four equal pieces by cutting it gently with a knife. 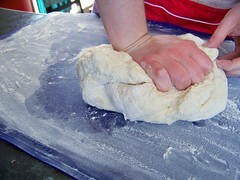 Flatten the dough into a rectangle by pressing it gently. Roll it up. 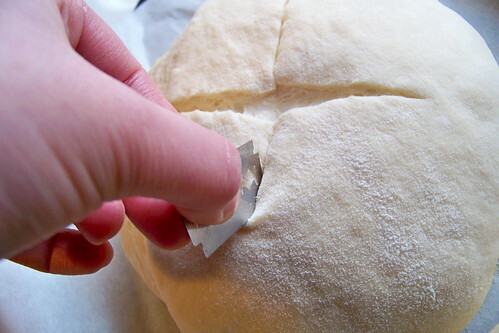 Seal the seam by pinching it. 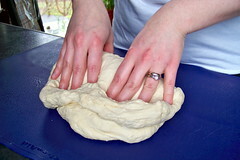 Then rock the dough back and forth until you have your desired loaf size. My bâtards still look demented. 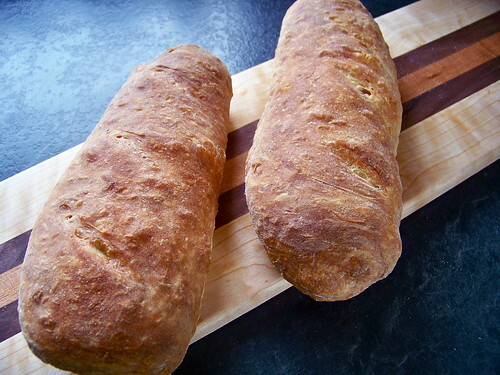 I wanted to do more with my loaves, so after leaving the bâtards for five minutes to sit, I took two of them to make épis (wheat stalks). 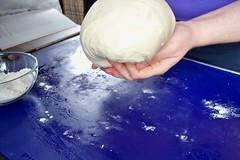 Mist the top of the dough with spray oil, cover with plastic wrap (loosely), and proof at room temperature for an hour and a half. They should be about 1 1/2 times their original size after that time. 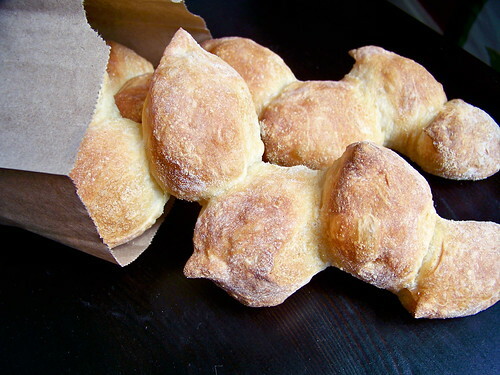 Prepare your oven for hearth baking, just like the Lean Bread. Place your baking stone in the oven along with your steam pan and turn up the heat to as high as it will go before broiling. Because my pizza stone isn’t long enough for the shapes I’ve created I’m using the back of a sheet pan instead, which means if you proof your bread on the sheet pan (on parchment paper dusted with semolina or cornmeal), then you can just stick it straight in the oven where the stone would be when it’s time to bake. 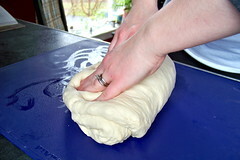 Remove the plastic wrap from the dough about 15 minutes before baking. 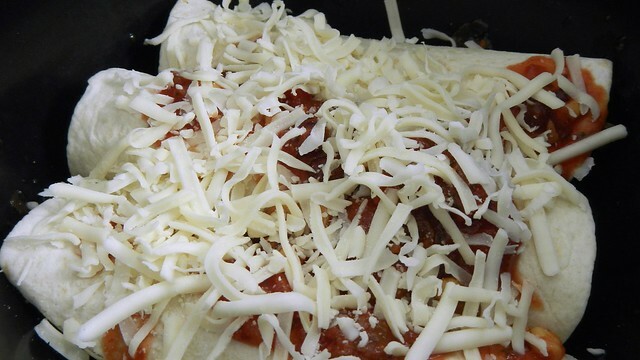 Right before baking, score the bâtards with a razor. 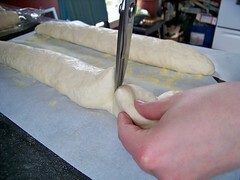 To make the épis, take your long baguettes and a pair of scissors. 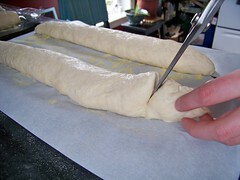 About 2 1/2 inches from one end, cut almost all the way through the dough (like 95%) at a 45° angle. 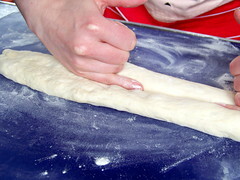 Pull the cut section of dough to one side. 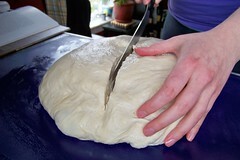 Repeat the cut a further 2 1/2 inches in, and pull that cut dough to the opposite side. 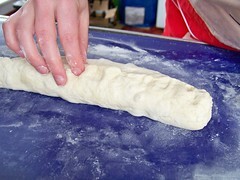 Repeat down the length of the loaf. My first one turned out kind of funny, but I got the hang of it by the second one. 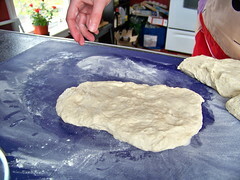 Transfer the dough to the oven, and pour one cup of water into the steam pan before reducing the heat to 450°F. 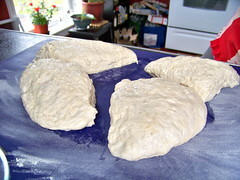 Bake the loaves for 15 minutes, then rotate and bake for a further 15-25 minutes. 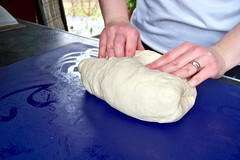 A finished loaf will be a rich golden brown and sound hollow when you tap the bottom. 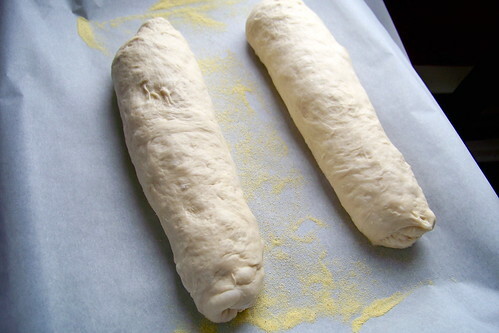 For a crisper crust, turn off the oven and leave the bread in for an additional 5 minutes. 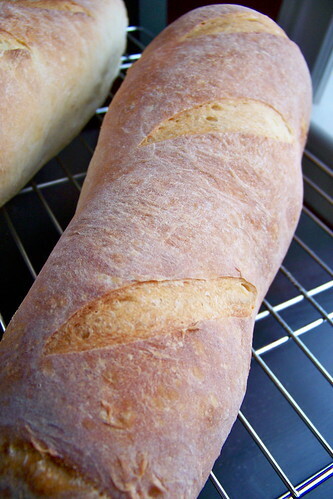 Cool your loaves on a wire rack for at least 45 minutes before slicing and serving. The bâtards came out demented, as expected, but the épis both looked fantastic. We took ours on the road for a Victoria Day luncheon with KK and IP. Very popular. 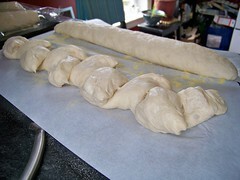 This is the first recipe in Peter Reinhart’s Artisan Breads Every Day (page 46), and my first adventure in fancy bread. 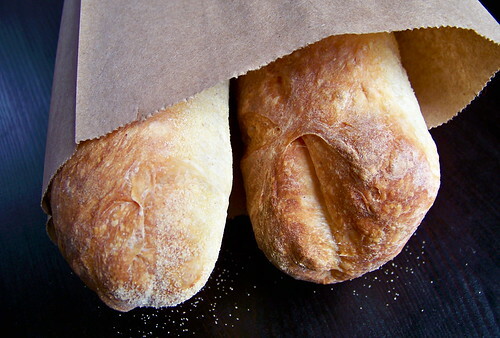 Artisanal bread recipes are intensive, for sure, but the process is pretty simple. There are many tiny instructions, but I think with practice all that stuff becomes second nature. 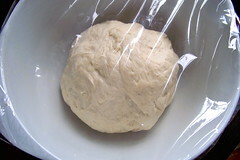 It’s more about timing, and having the patience to leave your dough overnight for fermenting purposes. 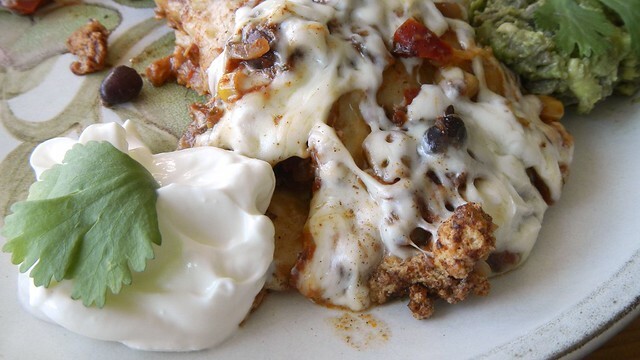 I plan to do this particular recipe a couple of times so that I can get it right before I move on to the next one. This post is epically long, and for that I apologise. But good bread comes out of it so it’s worth the time it takes to read. 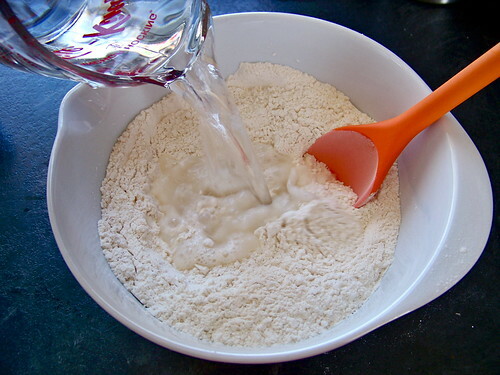 Combine, in a mixing bowl or in the bowl of your mixer, 5 1/3 cups unbleached bread flour, 2 teaspoons table salt or 1 tablespoon kosher salt, 2 teaspoons instant yeast, and 2 1/4 cups lukewarm water. Kosher salt doesn’t have any anti-clumping agents in it, so it is quite different in consistency and size from table salt or even sea salt. 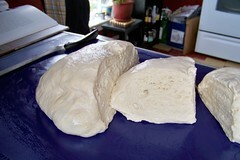 Also, Mr. Reinhart recommends using instant yeast because then you get the fermenting action started right away. 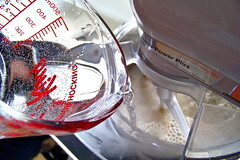 Stir or mix on the lowest speed setting for 2 minutes or until well-blended. I found that it all sort of clumped around my paddle and I had to remove it and start again before it took over the world. 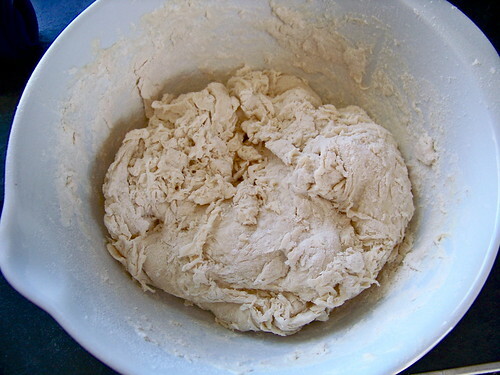 The dough should be, as Mr. Reinhart says, “very soft, sticky, coarse, and shaggy, but still doughlike.” Whatever that means. 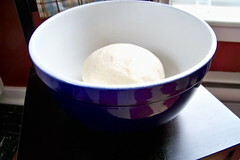 Use a wet spatula to scrape the dough into a clean, lightly oiled bowl. Let it rest there for 5 minutes. 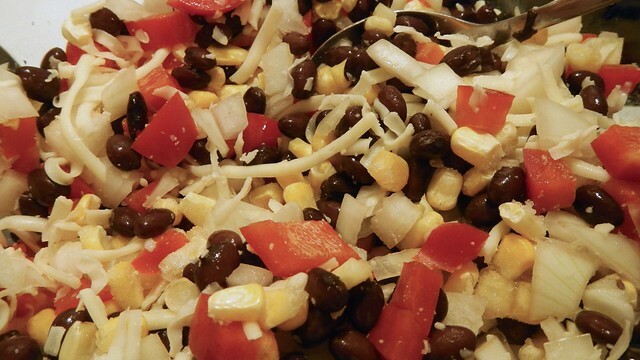 It should be soft enough to spread out over the bottom of the bowl. Mine, of course, didn’t. I think the wrangling with the paddle in the mixer made it a bit tougher. Once the five minutes is up you get to do some more fun wrangling. 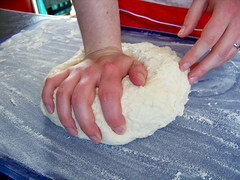 Put your dough on a slightly oiled surface. 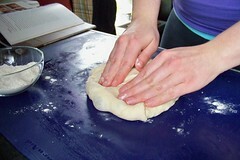 With wet or slightly oiled fingers, grab the front edge, stretch it out, and fold it over top of the rest of the dough. Now grab the back edge and do the same, then again with both sides. 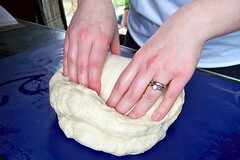 Finally, flip the dough over and bundle it into a ball. Put it back in the lightly oiled bowl and cover it with plastic wrap for ten minutes. Repeat this stretching step three more times, every ten minutes. You should get all your stretching out within forty to forty-five minutes. 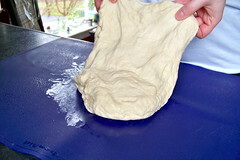 Using my tripod I’ve taken pictures of most of the whole process, just to show you the mechanics of the whole thing and also the changing texture of the dough as it gets stretched. The way Mr. Reinhart puts it, it’s like you’re aligning the gluten molecules through stretching, in the same way that iron atoms align along their poles when a magnet is created. Excuse my scary scarred and disfigured hands. They’re really not that weird-looking in real life – my hands are just not very photogenic. Also, that stuff? On my pants? It’s paint. I swear. Those are my painting pants. What, it’s a Saturday. I’m allowed to be lax in my dress. You should be glad you didn’t see my bedhead. Mouse over the photos to see where we are in the stretching process. Below is the second round of stretching. 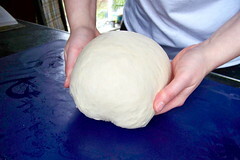 You can see that the dough is already smoother than it was to begin with. On to the third stretching round. After the third rest you can see that it’s already significantly larger than it used to be. 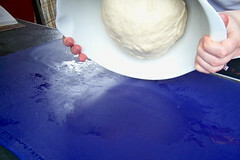 I also felt some bubbles in the dough that indicated the fermentation process had already begun. 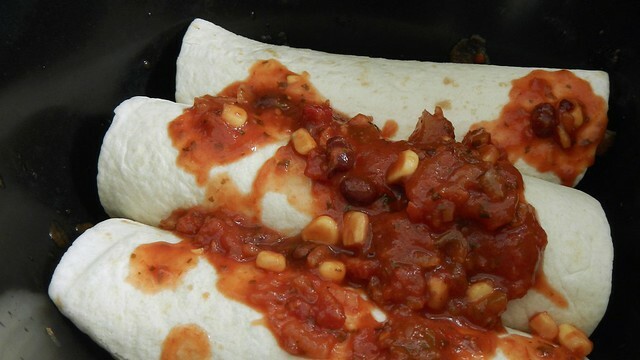 I hoped that popping them in the course of my machinations wasn’t to the bread’s detriment. 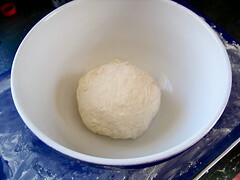 After the final stretch I tucked the dough into a ball and put it in a larger, lightly oiled bowl. 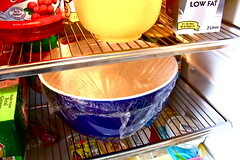 Immediately cover the bowl with plastic wrap (to keep in the moisture) and chuck it in the refrigerator to ferment overnight or up to 4 days. 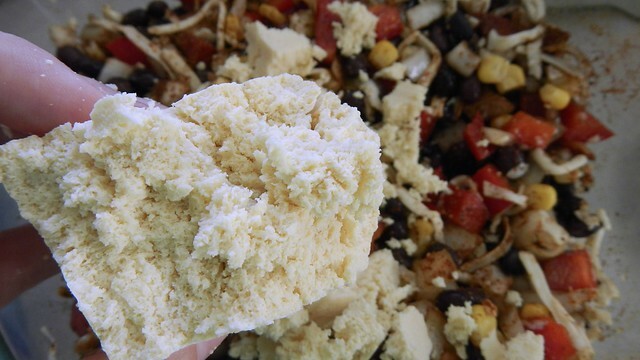 If you are planning on making loaves over the course of many days, this would be the point at which you could separate your dough into separate bowls for separate fermentation. I’m doing it all at once so it all goes in at once. 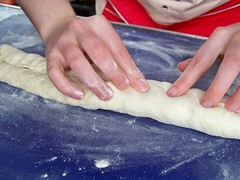 Take your dough out of the fridge at least two hours before you want to bake. Holy smokes look how HUGE my ball is! And check out that MASSIVE bubble on the top. It was sad to pop it, but the most gorgeous yeasty smell came out when I did so it was totally worth it. 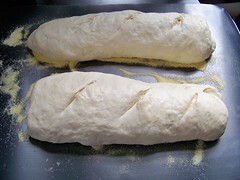 This recipe makes 2 large loaves, 4-6 smaller loaves, or 24 rolls. I’ve decided to make two of the three, see what comes out the best. Don’t want to get over-ambitious here. 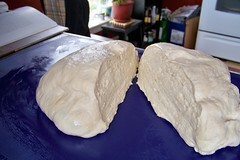 So I divided my dough in half. 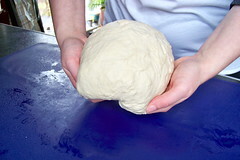 One half will become a round loaf called a boule (‘ball’). 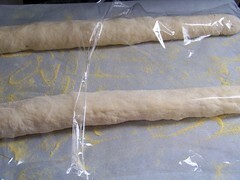 The other half will become 2 baguette-style torpedoes (or bâtards, haha, bâtards). 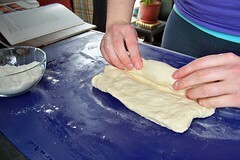 I used a sharp serrated knife to divide the dough, but you can use a pastry scraper as well. 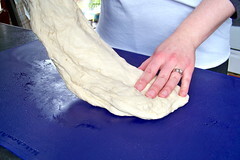 Make sure if you use a knife you let the serrated edges of the knife do all the work, and avoid pressing down into the dough. 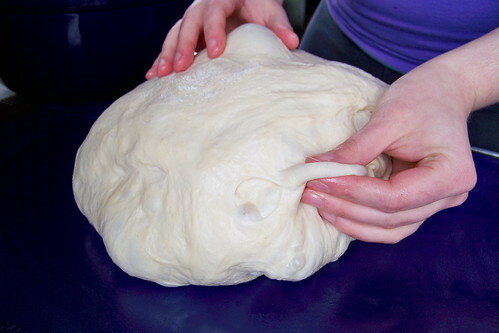 The trick to getting a crusty loaf is in maintaining the surface tension, so you want to pinch the bubbles you see on the surface to pop them, and be gentle in your stretching. This is pretty easy, and it’s something you’ve done several times before when you were in the stretching process. Prepare a bowl or proofing basket. 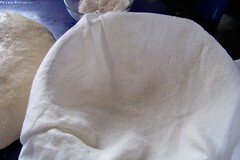 I don’t have the basket so I took a bowl and lined it with a linen couche or proofing cloth. 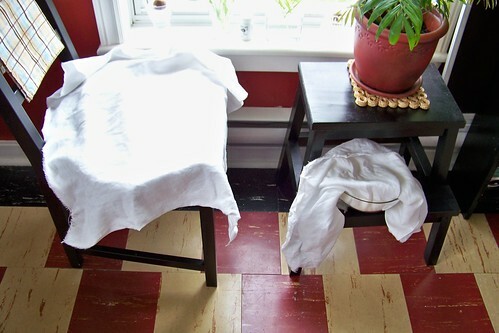 For me, this is an old linen tablecloth that became too stained for company, torn into sections. 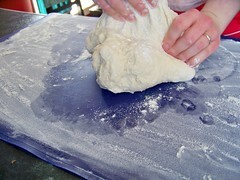 Spray the cloth in the bowl with oil and dust it with flour. 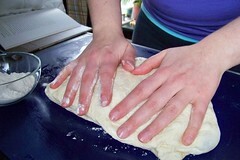 Gently pat the dough into a rectangle. 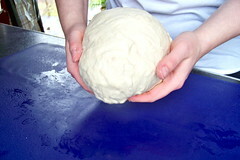 Gather the corners underneath and pinch together, stretching out the surface of the boule. 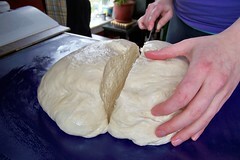 Place the boule, seam-side-down, in your bowl, mist it with spray oil and cover with the edge of the couche. You can see how my seam is already coming undone. Tsk. 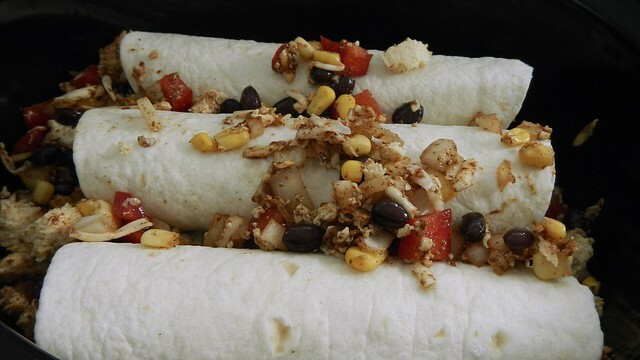 Prepare a pan by lining it with parchment paper and dusting it with corn meal or semolina. 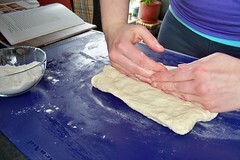 Pat the dough into a rectangle, popping the bubbles as you go. 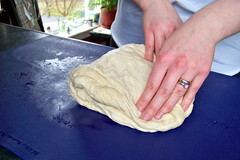 Using the edge of your hand, press a little furrow into the middle of the dough, running along its length. 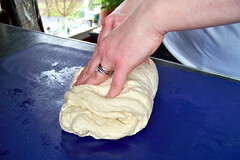 Roll the front end of the dough over the top of itself until it’s all rolled up. 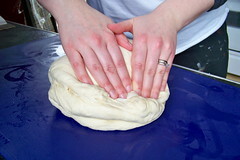 Rock the dough back and forth, seam-side-down, until the dough has reached a desired length, probably between 6 and 12 inches. 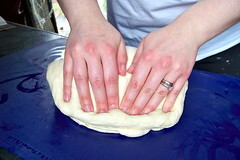 Set the dough, seam-side-down, on your prepared pan. 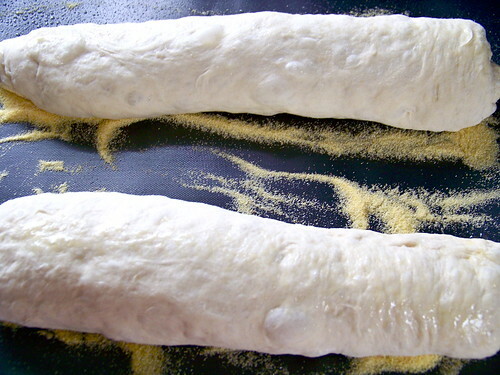 Mist them with spray oil and cover with a couche. I need some serious practice. 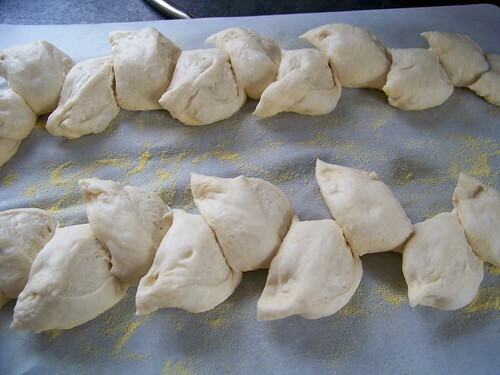 Look how lumpy and deformed they are. Tsk again. Proofing is a rest period in the fermentation process. 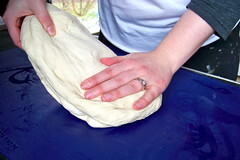 Once the bread is shaped, you let it sit, covered, at room temperature for an hour. Uncover it and let it proof for a further hour. 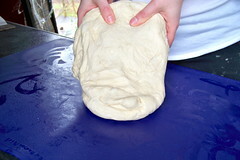 Uncovering it will let the top of the dough dry out a bit and firm up. The Pie and I received a pizza stone as an engagement present (thanks KB!) in the summer of 2008 (holy smokes has it really been that long? ), and we had yet to use it. 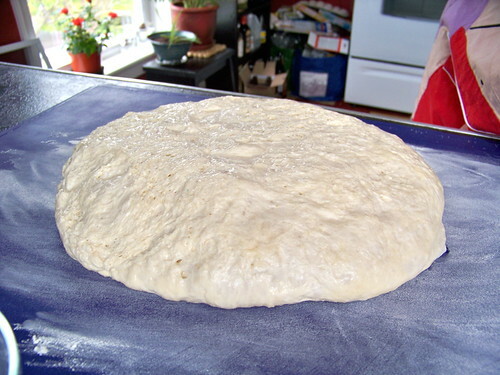 While the round shape of the pizza stone is not ideal for baking bread (Mr. Reinhart recommends an oblong shape), it’s the same consistency and will do the same job, which is giving a consistent heat without over-drying the bread. It’s like bread magic. You can of course do this with a sheet pan or cookie sheet instead, lined with parchment paper or sprinkled with semolina or corn meal. I already own the stone, so I might as well use it. 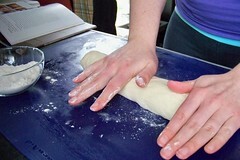 About 45 minutes before you start to bake, you want to prepare your oven for hearth baking. If you’re using a stone, place it on the centre rack and preheat the oven to 550°F or as hot as you can get it without turning on the broiler element. 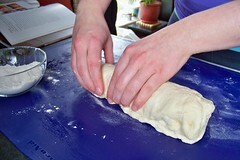 The key to that lovely crackly crust is steam, believe it or not. On the rack under the heating stone place a pan, like a rimmed cookie sheet, to be filled with water when everything gets hot. 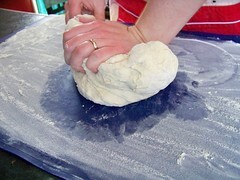 Just before baking, take your boule out of the proofing bowl and lay it on a clean surface, seam-side down. 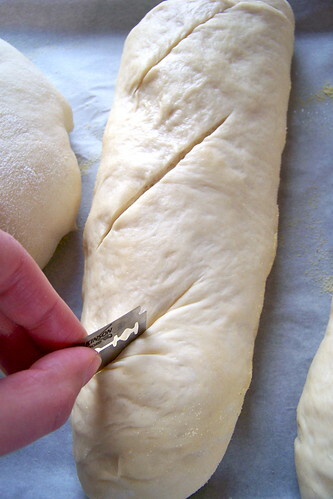 Using a razor blade, score a cross-wise slash into the dough, which will allow some of the moisture to escape while baking and maintain surface tension. 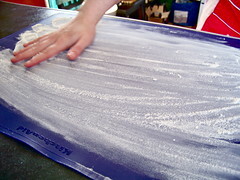 Ease your loaves onto your hot baking stone (use a peel if you’ve got one). 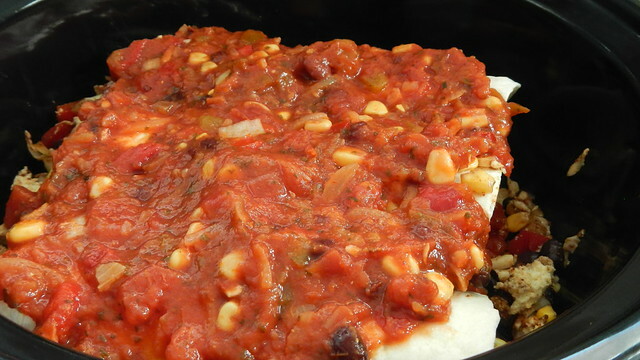 If you aren’t using a baking stone, put your prepared pan straight in the oven. I am pretty certain I overloaded my baking stone here, but I am not a patient enough person to wait and do it in two batches. It’ll just bake all stuck together and I’m cool with that. 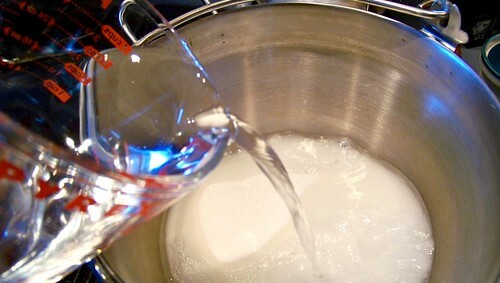 Very carefully pour one cup of water into the steam pan. Use long gloves and wear long sleeves as you do this to prevent injury. The Pie took this photo as I had my face averted and my whole body as far away from the heat as possible. 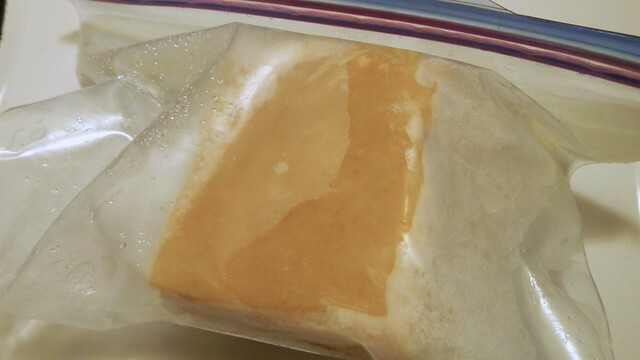 Reduce oven temperature to 450°F. 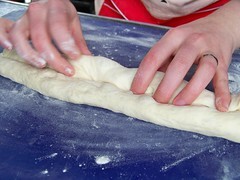 Bake for 10-12 minutes, then rotate the pan and bake for a further 10-12 minutes. 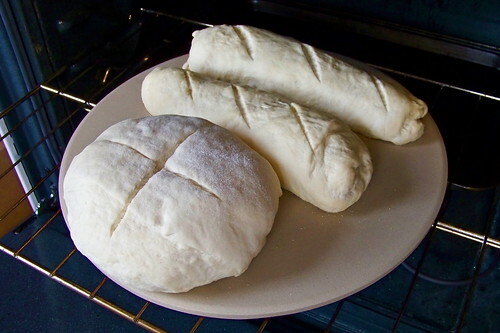 I found it easier to just rotate the bread, and I took the opportunity to break apart my breads, which were, in fact baking into one large lump as predicted. I think I saved them from looking too demented. 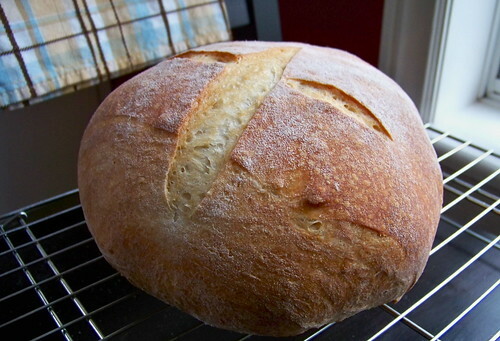 You can get a crispier crust by turning off the oven and leaving your bread in for another 5-10 minutes. 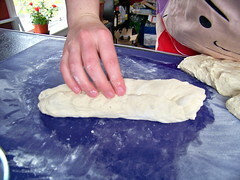 Smaller bread shapes will take less time, of course. 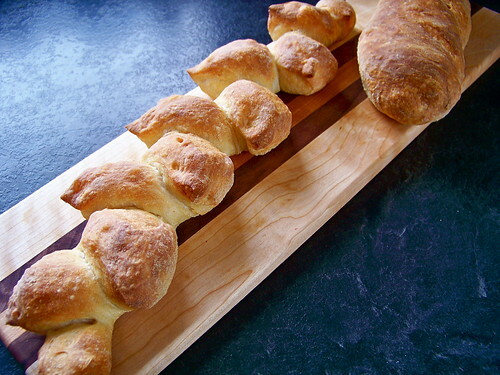 Cool your bread on a rack for at least an hour before cutting and eating. It’s a hardship, I know, after all that time you’ve waited. But it gets the crust all good. I promise. Or you could break the rules and eat some while it’s still warm. We did. Mmmmmm. 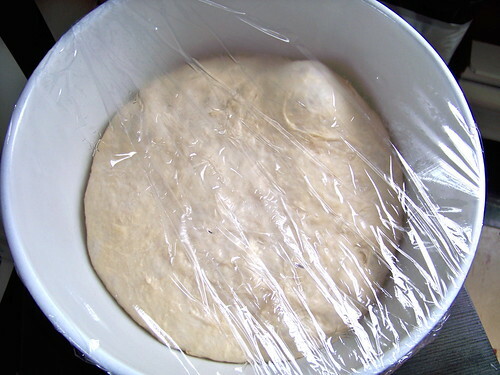 Wrap any uneaten baked bread tightly in plastic wrap and it will keep for a couple days. I found myself constantly comparing it to the knowledge I had of French bread, and so I had to constantly remind myself that this isn’t French bread. 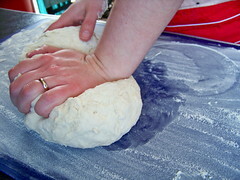 The dough is much wetter and the bubbles are much smaller. When the Pie took his first bite and looked at me I knew he loved me a little bit more, the bread was that good. 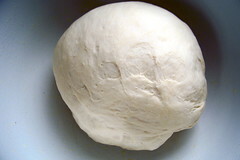 Mr. Reinhart says that the unbaked dough will keep in the fridge for up to a week, but that the flavour of the dough deteriorates after four days. 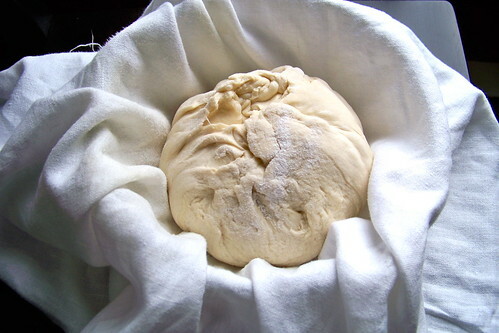 He suggests that if you want to keep some dough for later you can seal it in a lightly oiled freezer bag and freeze it after the initial overnight fermentation. 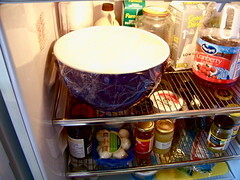 Thaw it in the refrigerator the day before you need it so it can thaw slowly without over-fermenting. 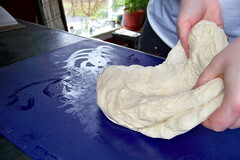 He also says that the dough makes excellent pizza dough.